Carefully and expertly handcrafted by our Amish artisans of solid wood, our Palmina Slat Bed is the ideal choice for your Mission style bedroom. Whether you are drawn to its clean lines or simple curvature, the Palmina Slat Bed is a smart addition to your bedroom interior. Slated headboard and footboard with ebony inlay are firmly affixed to the side rails of this piece with dowel joints for added security. All King and Queen sized bed include a center leg to ensure the integrity and support of the piece. Sleep confidently knowing your bedroom set is the result of skilled, Amish craftsmanship. Custom ordering affords you the luxury of selecting a wood species and stain to complement your design preference. 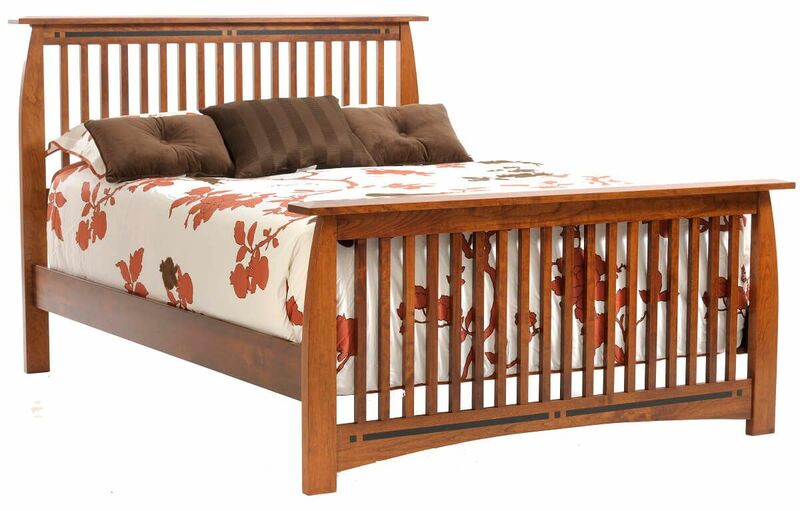 To obtain the pictured look for your slat bed, choose Rustic Cherry with our Cinnamon Stick finish.